The Witcher 3: The Wild Hunt has received another patch, this time aimed at improving the texture rendering of its higher end graphical settings. While The Witcher 3 has been privy to some of the highest praise an RPG has received in a good long time, the game has still inspired a number of a complaints from fans and critics alike. 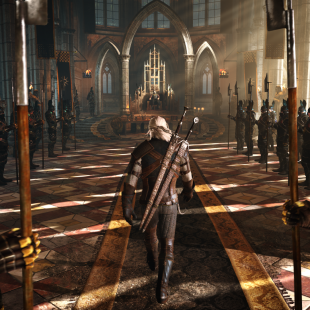 Key among these has been the fact that the game released last week doesn't visually live up to footage and demos shown off by CD Projekt RED over the course of its development. While the studio has responded to these sentiments, it would also seem that they're intent on improving the game's visual quality as much as humanly possibly. Case in point, a new PC patch (v1.04) released today has added in a number of changes including updates to the game's higher end visuals. More specifically, the patch will improve "texture rendering quality for the high and ultra presets." It will also improve the performance of NVIDIA Hairworks and fix the game's resolution settings so that the 1280x720 resolution will henceforth be "a valid resolution option." In addition to these fixes, the patch will add the option to assign custom key bindings and fixes a problem where players using "non-Latin characters" had been unable to import their save data from The Witcher 2. The patch will also make a series of minor changes to the UI and enhance the game's "overall stability and performance." Unfortunately, while the visual improvements at the core of the patch are welcome, they still won't fully make up for the downgrade that's left some gamers feeling cheated. Commenting on the disparity in a recent statement, studio head Adam Badowski attributed it to "the nature of game development" and explained that there was simply no way to realistically apply the visual quality seen in smaller demo builds to the massive world of the full, finished game. He would go on to say that the development team is "continuously working on the PC version" and that it would try to make up for the difference with future updates.